One of the criticisms of iPhone OS, the operating system that's used on the iPod touch and iPhone, is that it's a very closed system. The benefits are clear in terms of stability (Apple controls everything) and security (again, Apple controls everything), but the big drawback is that unless you jailbreak your device, you can't do anything you want with it. Over time, Apple's made various improvements that have resulted in jailbreaking being unnecessary for the vast majority of users, but there remains a big shortfall when it comes to data synchronisation and copying. On older iPods, in iTunes, you could usually set aside a chunk of drive space for storing documents, which could be copied across using Finder. This turned your music player into a memory stick of sorts, although, unsurprisingly, this didn't magically enable you to somehow read an important PDF on an iPod shuffle. 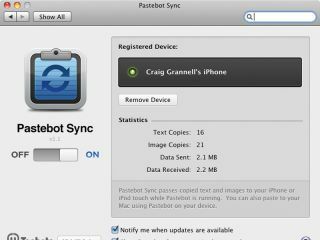 With an iPhone, despite the lovely screen and usable interface, things are even more restrictive — you can only sync and copy data that Apple allows you to. By selecting various options in iTunes, you can sync and copy music, videos, photos, Safari bookmarks, Mail email and notes, iCal calendars and Address Book contacts; but for arbitrary files, Apple seems to be suggesting that email's the way to get data on and off an iPhone. For very occasional copies, email is perhaps fine, but it's ultimately a kludge, and it certainly lacks the elegance and flexibility Mac users are used to. Maybe one day Apple will expand storage options for the iPhone, but in the meantime we're left wondering if "there's an app for that". As it turns out, there are loads. Pretty much every time Apple omits functionality from its mobile devices, someone enables you to plug the gaps for a few quid. On the following page we take a look at four apps that enable you to share many more file types than Apple's built-in software. Before you get started with the apps, there are some things you need to do. We've made the assumption that you're running Mac OS X 10.5 or 10.6 on your Mac, and iPhone OS 3 on your iPhone (or iPod touch — the apps work on either Apple device). If not, upgrade accordingly. Since the applications require wireless networking, we also assume you have a Wi-Fi network happily doing its thing and that your Mac and iPhone are connected. Regarding the apps, there's some crossover, so decide what kinds of data you'd like to share before you buy anything. For quick-fire storage and syncing, Dropbox is free, but if you require Finder-like file management and superior preview options, one of the Air Sharing apps is a good bet. If you're only interested in PDFs (sharing and reading), GoodReader does the job; and for sharing clipboard data, Pastebot is the only option. Then again, even if you splash out for the Pro version of Air Sharing, the total cost for all these apps is £8.37, which hardly breaks the bank, and we find each of them invaluable and use them on a regular basis.